Aniya Bess-Rosa is a graduate student at the University of South Florida studying Children and Adolescent Behavioral Health with a focus on Youth and Behavioral Health. 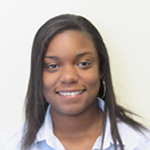 Aniya’s background includes working with children of all ages and in different capacities. Through her previous work experience in schools and shelters, Aniya discovered her passion for working with disadvantaged youth. Aniya is currently assessing the impact of recent immigration reform efforts on the mental health of children, youth, and families. When she is not doing research, Aniya spends her free time reading, playing sports, or entertaining her nieces and nephews.